The scan was performed with an extremely low radiation dose on a patient who had received a mechanical heart pump while waiting for a heart transplant. 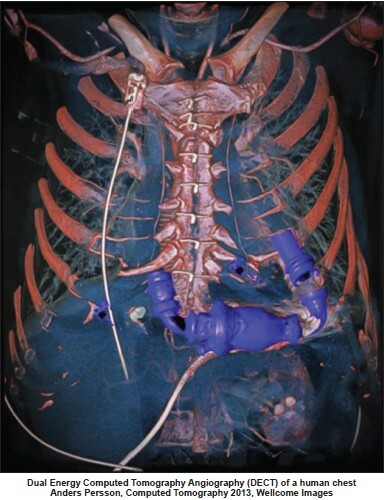 The image was rendered with a 3D volume rendering technique to check the wiring of the pump to the left side of the heart and to the aorta. The pump connection to the heart was faultless. DECT has two sources of x-rays (dual source CT) at different energies, which are used simultaneously to scan the patient. The patient is scanned in a series of virtual x-ray "slices" which are then digitally reconstructed to produce a 3D image. Colours and degree of transparency can then be applied to the various tissues. DECT provides higher quality images than conventional CT without the need for exposure to additional radiation. Submitted by: Rachel Hajar, M.D.